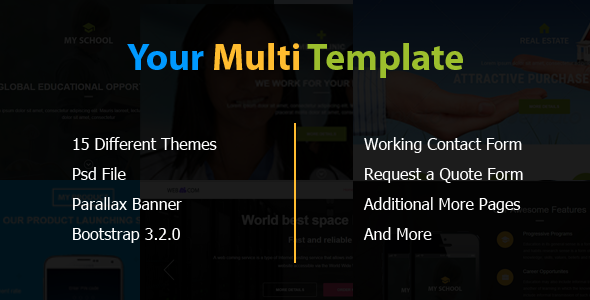 Your Multi Template is a Super clean Minimalist modern Responsive template using HTML5 & CSS3 based on Bootstrap 3.2.0. This is 2 different layout template, where you can choose your own template from 2 different layouts. The Header Background can also change to your custom image to change the Look and feel. Easy customization and Full documentation is included. Compatible with Major Web Browsers and Mobile platform.